Unlike other aircraft, Unmanned Aerial Vehicles (UAVs) owe their entire existence to communications. Over the past several years, DoD and commercial protected communications technologies have been converging. 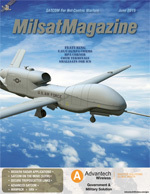 Just as today’s mobile phone user expects to roam across different countries and networks with a common handset, so, too, does the modern Defense Force user demand true broadband services across a range of different satellite options—without having to use multiple SATCOM terminals or experience an outage while swapping different RF kits. The concept of reconfigurable space-based capabilities is gaining traction in our industry, as evidenced by the lively Satellite 2015 panel. Increasing the application of this approach will change the way we design, build, deploy, and use our platforms. For all of the hue and cry about small satellites, you would think they were invented yesterday.